Although frozen meals can be convenient, many offer poor nutrition and are best reserved for rare occasions. Frozen foods are not all evil, however; freezing fruits and vegetables can help prevent nutrient loss, and because frozen foods are portion-controlled, they sometimes help with weight management. The key is to buy healthy options that contain natural, quality ingredients. Frozen foods -- particularly prepared meals -- are often high in sodium. Excess sodium can lead to high blood pressure, which is linked to heart disease and stroke. You should limit your sodium consumption to no more than 2,300 milligrams per day, recommends the Centers for Disease Control and Prevention. If you're over age 50 or have high blood pressure, diabetes or chronic kidney disease, you should limit sodium to no more than 1,500 milligrams per day. For comparison, one piece of frozen lasagna with meat sauce may contain more than 900 milligrams of sodium. Some frozen dinners are very high in fat. Because fat contains twice the number of calories compared to carbohydrates or protein, this often makes frozen dinners high in calories, by default. For example, a 1-cup serving of frozen chicken pot pie may contain nearly 600 calories, more than half of which come from fat. Each pie is 2 cups, so eating the whole thing will net you about 1,200 calories and more fat than many people need in an entire day. No more than 20 percent to 35 percent of your total calories should come from fat, according to the publication, "Dietary Guidelines for Americans, 2010." 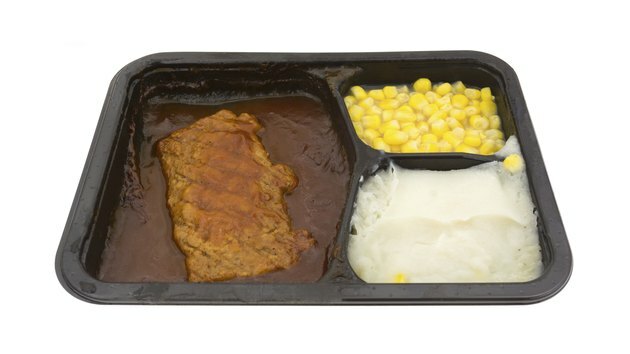 Although diet frozen dinners are marketed as helpful for weight loss and proper nutrition, they may do more harm than good, according to registered dietitian Karen Collins. Collins notes that these meals, which often have fewer than 300 calories each, won't sustain you for long, compelling you to reach for high-calorie snacks soon after you eat them. Collins also reports that such meals are typically too short on fruits, vegetables and grains to provide the nutritional balance you need for optimal health. While frozen foods are not off-limits, finding healthy options requires that you regularly check nutrition labels, recommends the American Diabetes Association. You should choose frozen dinners that have 500 or fewer calories and 600 or fewer milligrams of sodium. The association also recommends that you should consume products that have 3 or fewer grams of saturated fat, because too much saturated fat is linked to heart disease. Look for choices that have whole grains, such as brown rice or whole-wheat pasta, and that also include a colorful array of vegetables and fruits. NBCNews: Should You Defrost Your Diet?